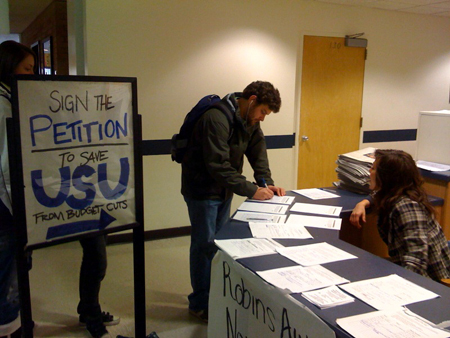 January 23, 2009 | Concerned students at Utah State have been making ripples in the water of the state's political pond in the face of looming budget cuts that could amount to as much as 19 percent. The students vary in age, program and background, but all have a vested interest in Utah State being spared from the major cutbacks. The budget cuts, as proposed by the Utah State Legislature this month, will likely result in increased class sizes, less funding for research, the dissolution of programs and services, and increased tuition costs if passed. Dani Babbel, a senior majoring in anthropology, is one of the students leading the charge in this effort. Babbel decided to take her campaign public using the popular social networking Web site Facebook. "I had never really done much on Facebook before, but I just decided that it was time to do something more," Babbel said. "I couldn't just sit back and let this happen." As her group, appropriately named "Save Higher Education in Utah," swelled to more than a thousand members in its first two days of existence, Babbel met a host of students from across the state who felt the same way she did. During this same time, the Associated Students of Utah State University were already knee deep in their own preparations to battle the newly announced budget cuts. More specifically, the ASUSU Government Relations Council (GRC) had already planned an on-campus rally to feature students and administrators who were against the budget proposal. Additionally, a rally at the Utah State Capitol was being coordinated. The cherry on top of these ambitious plans is a circulating petition for which the GRC intends to collect 10,000 signatures. "This is something that the students really care about," said Adam Blanch, a senior in international studies and a member of the GRC. "They know that no matter who they are or what they're studying, they're going to be affected by the cuts." Blanch said the message that the students are trying to get across to the Legislature is that higher education is Utah's most valuable investment, citing that students are the future leaders, voters and taxpayers of the state. Over the last two weeks this cause has picked up an unprecedented amount of momentum. The Facebook group has recruited 4,000 members, and meanwhile student organizations have pledged their support to help reduce the budget cuts. Among the contributing groups are the Interfraternal and Panhellenic organizations, Residence Housing, the department of anthropology, each of the university's seven college councils, the Graduate Student Senate, and several other campus clubs and organizations. The students have thrown their support behind an alternative budget proposal given by Gov. Jon Huntsman Jr. The governor's plan calls for a less drastic 11 percent cut to the higher education budget, and also an implementation timeline that allows the cuts to take place over the course of two years. According to Huntsman, his proposal will make the cuts easier to absorb. While the efforts of these students has yet to gain the attention of the mainstream media or the majority of the Legislature, they intend to change all that when they rally on Capitol Hill on Jan. 30. After the rally, they will present their petition to the state lawmakers.